According to scholars in ancient Hebrew culture and the Bible such as Dr. Michael Heiser, yes it does. They did have ways to described spherical objects as opposed to a circle inscribed on a flat surface, and the many references to the cosmos are always given in terms of a flat surface with a foundation and solid dome for the sky. However, others (such as this and this, who may or may not be experts), argue that there is enough ambiguity to allow a wider range of meanings for specific words. Now of course, experts can be mistaken in their conclusions and logic. 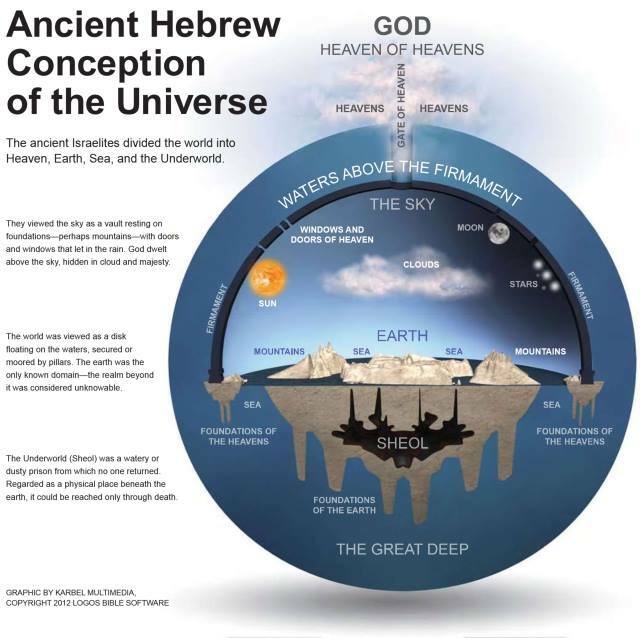 For Dr. Heiser, since the language of the Old Testament clearly indicates a flat earth, the only conclusion to draw is that it’s "theological messaging", or what is more commonly termed "allegory" or "spiritualization". His other premise for this conclusion is that science must be correct and is not to be questioned. If memory serves, Dr. Heiser also takes Genesis 1 as "theological messaging" for the same reason. That is, the Hebrew text clearly indicates creation of the cosmos in six literal days, but Dr. Heiser accepts the modern science community’s belief in very long ages. But perhaps the strongest point he makes is that if one takes creation week literally rather than as "theological messaging", then one must do the same for the shape of the earth and cosmos. We cannot pick and choose which is literal, since the genre is history (Genesis), although much of the rest of earth-shape passages are in the poetic genre. Yet Dr. Heiser would argue that a spherical or ball earth is conspicuously absent from any genre in the Bible. In prophecy yet to come, we are told that the stars of heaven will fall to the earth like figs falling from a tree violently shaken by the wind. Unless this is taken completely symbolically, it cannot be true for a spherical earth with stars many times larger than itself and many light-years away. On the other hand, if "stars" can include meteors, then there is no conflict. This question challenges the literal / historical / grammatical hermeneutic. Even in apocalyptic literature such as Revelation, many hold that the judgments are quite literal, along with the nations involved and the final outcome. If the immediate context does not indicate a simile (e.g. "I saw one like a lamb") or metaphor (e.g. "the woman on the beast is that ancient city"), there is no basis upon which to take something as non-literal just because the general genre is prophecy or apocalyptic (which means "revealed"). Rev. 6:13 is where it tells us about the falling stars, preceded by a great earthquake, the sun turning black, and the moon turning to blood. It is followed by the account of the heavens receding like a scroll and all the mountains and islands being shifted. If it means literal stars and not meteors, which parts of that are not literal, and why? If we follow the lit./ hist./ gram. method of interpretation, consistency demands that we take the falling stars as literally as everything else. Yet if we follow the "theological messaging" hermeneutic, we create an even bigger problem: how to decide when the Bible is ever saying anything literally. Why, for example, should this method treat the resurrection of Jesus from the dead as literal history? If we rely solely upon external evidence (of which there is plenty), then we must ask what purpose the Bible has at all, since it is supposed to take a back seat to every other religious document or scientific pronouncement. Speaking of science (really, scientism), there is ample reason to question evolutionary theory with empirical science alone; see for example Science Against Evolution . Yet most of the world considers criticism of evolutionary theory as tantamount to denying all science--- in spite of the fact that real scientists who invent things like the MRI machine are young-earth creationists (see outstanding creation scientists for this example and many more). Evolution has become a religion, just as the Big Bang/Gravity cosmology has become a religion. So then the question for those such as Dr. Heiser becomes, why do you trust scientism at all? By its own admission and boasting it is in a continual state of flux, to the point where nothing is falsifiable anymore and thus not scientific. This begs the question of why evolutionists so zealously defend the scientific "facts" of the day, since they brag about the likelihood that they will be disproved tomorrow. And we haven’t even considered the overwhelming evidence that ancient cultures had very advanced technology. Did these ancient cultures, with their superior technology, think the earth was flat? Many sources state that this was the case until about the sixth to fourth century B.C. So it would appear that the flat earth model was indeed presumed by the ancient advanced cultures. Yet on the other hand, the pyramids of Egypt seem to indicate measurements for the earth’s circumference, but note that circumferance is true of even a disk shape and not just a sphere. So if we cannot trust today’s alleged scientific facts (re. the cosmos and its beginning to the present, as opposed to practical, observable scientific facts), then why must the Bible be made to defer to them? We should also be aware that there is growing evidence that NASA and equivalent space agencies around the world have been falsifying images. In spite of all our alleged technology, there is not one undisputed photo of the earth or any man-made satellites; all are either composits or CGI representations. There is also growing suspicion that all the Apollo missions only showed studio photos and videos, and that 1960s technology couldn’t possibly have done what they claimed. The reader is encouraged to search this out on their own, as it is beyond the scope of this article. But this deception could also be explained by the limits the Van Allen Radiation Belts put around a spherical earth. The point of daring to question modern scientism is this: If they are lying about so many things, can we trust them at all? Do we really have more reason to believe them than to believe the Bible? Should Christians defer to what is claimed to be today’s scientific facts, and bend the Bible to fit them? I am not here to proclaim that the earth is flat, or spherical, or even the ridiculous claim of Neil DeGrasse Tyson that the earth is now pear-shaped (which would mean that the equator is not the widest part of earth). People today would believe the earth is a cube or pyramid if NASA told them so. But in a time when any and all crazy theories are floated as probable or at least possible (space aliens and "ancient astronauts", dark matter and "quantum fluid" which is a fancy name for aether as believed by scientists in the past, "god particles", remote viewing, reptilians, etc. ), one must wonder why the idea of a flat earth is the one and only conspiracy theory that not even the most die-hard "tinfoil hat" wearer will consider. The other point of this post is to get Christians to make sure that their methods of Bible interpretation are consistent and defensible. Where do you draw the lines, and what do such lines imply? If you believe Jesus rose from the dead very literally (and you must in order to be a Christian), then why must everything else in the Bible be treated as a blank slate upon which you can write whatever you want? And if you come to the point Dr. Heiser reached, where you must choose between the Bible and prevailing scientism, what will you do? Be sure that you can justify a non-literal meaning without violating the lit./ hist./ gram. method. Personally, I believe both sides of this issue make logical errors. But though I don’t know Hebrew at all, what I know about Greek and language in general makes me question Dr. Heiser’s hard boundaries on word meanings. But the point is that neither earth shape can be definitively ruled out, and we should be aware of these issues when discussing scripture on any topic. We should also remember an important principle of interpretation of scripture: that God meets people where they are and gently leads them to where they should go. For example, God did not forbid slavery but regulated it in the Old Testament, and the New Testament only tells Christians how to behave if enslaved and to get out of slavery if possible. But the teaching of Jesus and the apostles is that of freedom from oppression, of the equality of all people, of the ultimate destruction of hierarchy based upon the flesh or social standing. Many once argued (and some still do) that the Bible teaches and approves of slavery, because the teachings are not explicitly against it. Yet this is not "theological messaging"; it is meeting people where they are, with the goal of moving them away from oppression and inequality. Thus the lit./ hist./ gram. method remains intact, as does the age of the earth and the undefined shape of the earth.